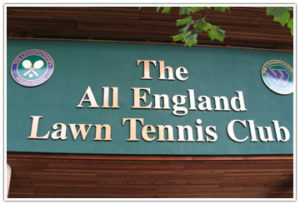 Wimbledon Tennis and Travel: Wimbledon is most famous for the tennis tournament. I used to see all the finals on TV before I got an opportunity to see it in person. 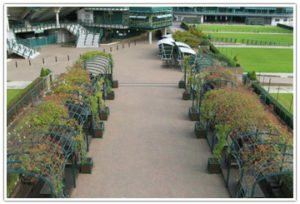 I visited the Wimbledon Tennis Tournament first in June 2001 and fell in love with the place. In my opinion, the Wimbledon championship is probably one of the greatest sporting events for tennis lovers. So, if you are looking forward to the 2016 Wimbledon championship, here is all the information that you need about the tournament. 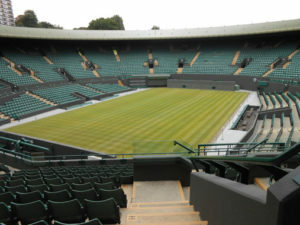 Wimbledon Attractions: Wimbledon Home Wimbledon Station from Courts Wimbledon History Wimbledon Photos Wimbledon Museum 2016 Dates Postcode and Address Prize Money Tennis Tournament How to get Tickets for 2016? Some tickets are sold in advance, by lottery, by memberships etc. Rest have to be bought on the day. I queued from 5:30 a.m. and there must have been 10000 people ahead of me already. Many were with their tents clearly indicating they had fun. Met a few friends as well. I went to see the tournament again in 2002. England’s Tim Henman lost (again!) much to the disappointment of local fans. 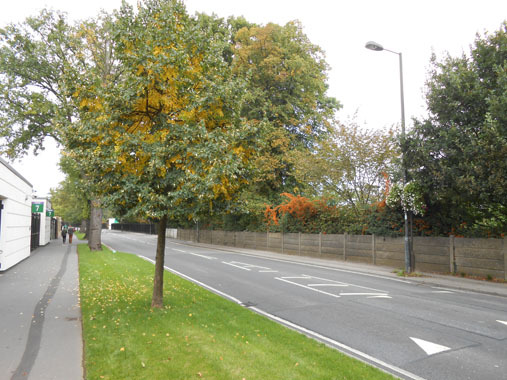 My most recent visit was in 2013 and I have uploaded several latest pictures taken during this trip to Wimbledon. Check out all the pages on the left side menu bar. The small hill within the premises which has a huge screen to watch the matches having a beer is called Henman Hill in the honor of current best British Player. I think from 1997 onwards it will be called ‘Murray’ hill in honor of next best player ‘Andy Murray’. Hope he doesn’t disappoint us. I got an opportunity to rub shoulders (literally) with who’s who in tennis – Martina, Leander Paes, Mahesh Bhupathi, A. Sanchez, Roger Federer, Patrick Rafter, Lisa Raymond, Elena Likhovtseva and many more. I saw a crowd, barged in, took an autograph, did not realize who it was from. He did not look like a tennis player! Asked my next person who said it was ‘Sir Steve Redgrave’. I nodded claiming ‘oh! That’s great’. After going home in the evening, searched on the internet to see who he was. Sir Stephen Geoffrey Redgrave CBE (born on 23 March 1962, in Marlow, England) is a British rower who won a gold medal at five consecutive Olympic Games from 1984 to 2000, as well as an additional bronze medal in 1988. As the only Briton ever to achieve this feat, he is widely considered to be Britain’s greatest Olympian. Redgrave also won a bronze medal with Andy Holmes in the coxed pairs in 1988. He has won nine Rowing World Championship gold medals. 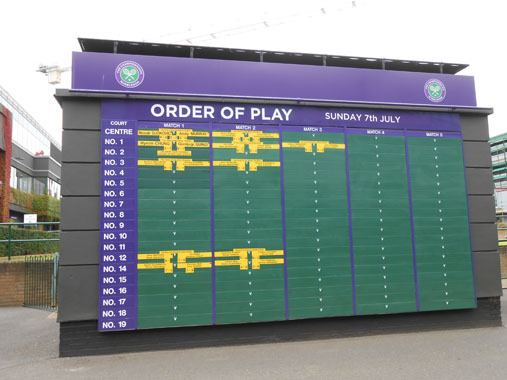 Order of play for Wimbledon 2016 will be displayed on these boards at the entrance.